San Diego Harbor Police investigating the floating body on San Diego Bay Saturday. Photo via OnScene.TV. 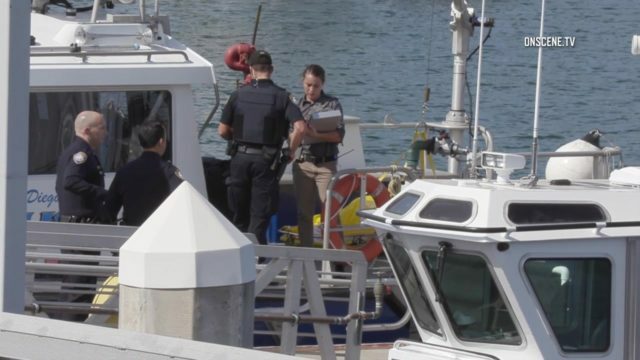 A body was discovered floating in San Diego Bay Saturday, authorities said. Employees at the Continental Maritime of San Diego shipyard, which is located near the Coronado Bridge, called police just after 11 a.m. to report the finding, San Diego Harbor Police Lt. Jonathan George said. “They spotted the body floating near one of their booms,” George said. Responding officers recovered the body of an unidentified white male, he said. So far, police aren’t sure if there was foul play. “There was nothing that we saw that would indicate to us that it was (suspicious), but we have no idea what the cause of death is right now,” George said. The San Diego County Medical Examiner’s Office was called in to investigate.